MDMA, molly, or ecstasy is a popular drug especially among young Americans. It is a dangerous stimulant and psychedelic that causes a number of long and short term consequences. 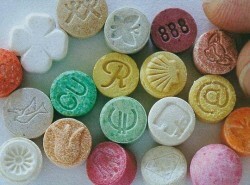 MDMA is often found in pressed pill form with varying colors, designs, and shapes. MDMA is a drug that is more widely known as ecstasy or molly on the streets. The scientific term for MDMA is methylenedioxy-n-methylamphetamine. When taken, MDMA produces euphoric effects and can reduce anxiety leaving the user feeling comfortable, intimate and outgoing. There have been suggestions as to the use of MDMA for therapeutic effects but such use is no longer accepted in the United States. Recent clinical trials are focused on testing the use of MDMA for the treatment or therapeutic relief of post-traumatic stress disorder and certain types of anxiety. Although this drug is not accepted for use in the United States, studies estimated that nearly as many people use MDMA as those who abuse cocaine, prescription pills or amphetamines. Unfortunately, the increase in blood pressure, heart beat and temperature are some of the greatest dangers for those who take MDMA. These effects are not easily spotted but they can cause serious side effects for the user if they spiral out of control and are not treated. MDMA can cause serotonergic neurotoxicity which can lead to additional problems for the user. This drug may also be to blame for a lowered ability for the user to create natural serotonin levels which may lead to depression and other serious long term effects if the drug use persists. Often times, MDMA overdose occurs when a user is taking the drug with other drugs. Overdose is also likely when the drug is taken repeatedly or for a prolonged period of time. While there is no level of MDMA use that is considered safe, the risks associated with overdose are greatly increased when a user continues to take the drug over and over again. Taking MDMA with other drugs can lead to serious side effects or even death. Certain drugs such as Nardil, Parnate and Norvir are also known to dramatically increase the risk of deadly overdose when combined with MDMA. Although MDMA itself is not widely considered an addictive substance it can cause a lack of serotonin production which will lead to depression. The depression that occurs when a user stops taking MDMA can cause a subsequent desire to take more of the drug in an effort to fuel the happiness or comfort level that is understood when taking MDMA. If a user continues to take MDMA over and over again, the risk of permanent damage to the serotonin production efforts increases. People who become addicted to or dependent upon MDMA are most likely to benefit from counseling and therapy but may also require medications to help restore balance to the chemical composition of their brain. Antidepressants are often administered following an addiction to MDMA to help restore the serotonin production and balance out the depressive state of the user. This method of treatment is not always necessary but for a user who attempts to quit using MDMA and suffers from serious side effects of depression, antidepressants can help. Counseling and therapy are vital to any method of treatment and recovery from MDMA addiction. Counseling and therapy provide the user with a safe, comfortable atmosphere in which they can discuss their drug use, the effects that the drug use has had on their lives and various other factors surrounding their addiction. There are many different levels of counseling and therapy including individual and group counseling that places focus on varied aspects of the user, their lives and their addiction.